The Benjamin Franklin Academics Plus School in the Lawncrest neighborhood of Northeast Philadelphia is getting a makeover. While the school is located among the bustling shops and restaurants along Rising Sun Avenue, the neighborhood lacks green spaces where neighbors can connect with nature. 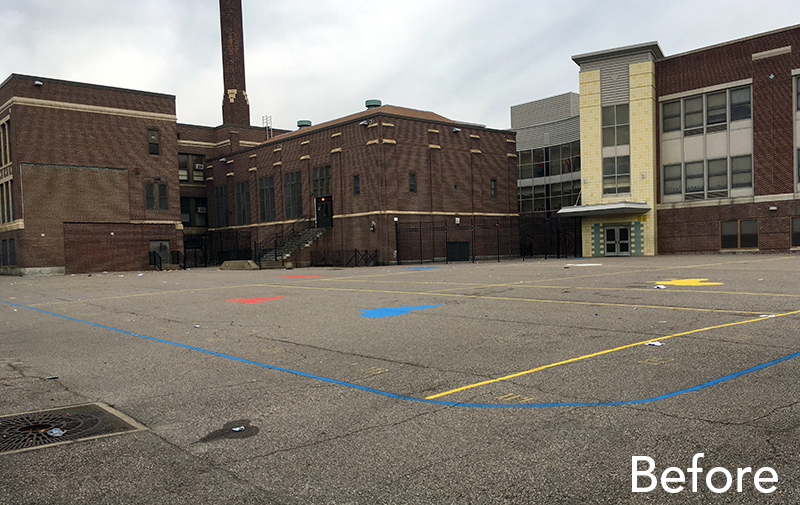 We are proud to partner with the School District of Philadelphia and Philadelphia Water to transform the school’s asphalt lot into a new and exciting space for play and outdoor learning. The students at Benjamin Franklin, guided by our Philly team, are designing their new schoolyard, and with such a culturally diverse student body, there is sure to be something for everyone! The school lies within the Tookany-Tacony-Frankford watershed, and the students’ design will include elements to reduce water pollution. Once the students’ schoolyard concept is created, we will work with our agency partners to finalize the design and oversee construction. When complete, the new schoolyard will be open for the entire community to enjoy.